Possibly the best travel game of all time, Bananagrams is great to take with you wherever you decide to go. From its fun Banana storage bag to the very easy game play, you'll relax as you play this game (and even eat a real banana - not included). Younger kids can take part in this educational game and adults can battle it out using as much creativity as possible. Bananagrams is simple; there is no score. No need to learn complicated rules or read through pages of game instructions. All you need to do is correctly place down words and be the first to get rid of your tiles. That's it! Inexpensive, easy to transport, easy to learn, a blast to play with new challenges every time - what more could you want. Pick up Bananagrams and play it today! If you can successfully use up all your letters then you are the Bananagrams game winner. Bananagrams comes with 144 tiles, a storage bag and the official Bananagrams game rules and instructions. Please keep in mind that the official Bananagrams party rules and instructions could be different depending on the game version you have. The rules below are some of the exact directions on how to play Bananagrams. Share with us your comments, funny stories, tips, advice, strategies, creative ways to play, questions about how to play, problems with the rules or anything you want about Bananagrams. All submissions will be reviewed within 24 hours. 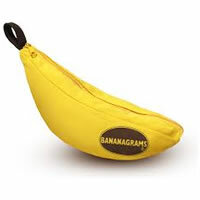 Click here to add your Bananagrams comments. Question: player pulled all their tiles (48) while other players did not- one player had 46 and another had 44. Player with 48 tiles played called BANANAS. Other two players dq’d player with 48 tiles because there were still 4 tiles left in the center. Should have the player been dq’d since they played all their tiles?